UPDATED March 24th 2016: Test Data Retention is now added to TFS 2015 Update 1, see this post for more information. 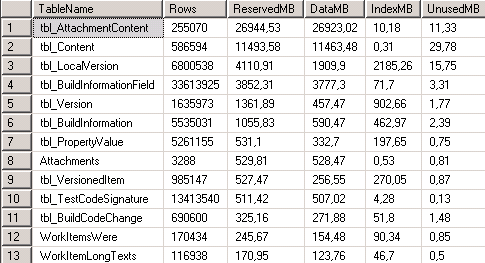 UPDATED Mar 17th 2012: Added sql queries for TFS 11 Beta. Changed structure after Adam’s advices. Updated information. Recently there has been several reports on TFS databases growing too fast and growing too big. Notable this has been observed when one has started to use more features of the Testing system. Also, the TFS 2010 handles test results differently from TFS 2008, and this leads to more data stored in the TFS databases. As a consequence of this there has been released some tools to remove unneeded data in the database, and also some fixes to correct for bugs which has been found and corrected during this process. Further some preventive practices and maintenance rules should be adopted. You have started to run manual tests, and includes video’s, images and collects a lot of data during the runs. You have automated your test runs, and includes code coverage information. This adds all the binaries to the TFS too. You are running a version of Visual studio 2010 that haven’t been updated (as detailed below), and thus manual testing and automated testing during build pushes up binary files. Deployment items are no longer being uploaded, even for code coverage there is no upload, as the way it works have changed. System information files are now uploaded once per test run. If your testrun consists of multiple test cases, like when you use a test suite as basis for a test run, you will now only get one system information file, whereas in 2010 you got one per test case regardless of how it was run. As they are identical, this was just waste. All test attachments are now compressed and decompressed on the client side, reducing both space on server and download time. A trx file consists of multiple small tr_ files. 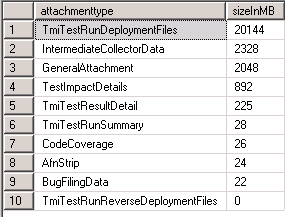 In VS 2012 a single trx file is uploaded, which consist of all test case results for that test run. See this blogpost for detailed information about this. Anu’s very important blog post here describes both the problem and solutions to handle it. She describes both the Test Attachment Cleaner tool, and also some QFE/CU releases to fix some underlying bugs which prevented the tool from being fully effective. This forum thread describes the problem with some solution hints. Grant Holidays blogpost here describes strategies to use the Test Attachment Cleaner both to detect space problems and how to rectify them. All the published data above is published into the TFS database as attachments. The test results will include all data being collected during the run. Some of this data can grow rather large, like IntelliTrace logs and video recordings. Particularly annoying is the pushing of binaries which happen for automated test runs. This is in earlier versions of TFS the default setting, whereas in later versions it has been reversed. The binaries includes all the programs dll’s and exe’s, and is pushed up to prepare for a second run. Normally that never happens, so there is really no point in polluting the database with these binaries. These binaries are often seen to be the highest size contributor. The goal of this post is to give you a step-by-step process to get a smaller database. Even if you have got the problem or if have yet not got the problem, you should ensure the Visual Studio MTM and SQL server is set up so that the risk of getting into this problem is minimized. To ensure this you should install the following set of updates and components. Note that the TFS Server itself does not affect this, but you should also keep that up to the latest upgrade. See my blog post here for the latest extensions, updates and patches or Grant Holidays excellent post here for further details. You should preferable update to CU2, otherwise you can install the QFE for KB2608743 – which also contains detailed instructions on its use, download from here. Code coverage is enabled in the test settings. You change the UploadDeploymentItem to true in the testsettings file. This has to be done by editing the testsettings file as an XML file, this is not in the UI. Change it in the element named Deployment. Be aware that this might be reset back to true by another user which haven’t installed this QFE, or is running a non-CU2 VS/MTM. It is not required to install it to the TFS Server, test agents or the build controller – it has no effect on these programs. The hotfix is named as a TFS Server hotfix, but further down in small letters it is stated it doesn’t apply to the server itself. If you use the SQL Server 2008 R2 SP1 you should also install the CU 4 (or later) (for pre-SP1 it is the the CU 10 ). This CU fixes a potential problem of hanging “ghost” files. This seems to happen only in certain trigger situations, but to ensure it doesn’t bite you, it is better to make sure this CU is installed. The problem is a stalled ghost cleanup process. Restarting the SQL server after having stopped all components that depends on it, like the TFS Server and SPS services – that is all applications that connect to the SQL server. Then restart the SQL server, and finally start up all dependent processes again. (I would guess a complete server reboot would do the trick too.) After this the ghost cleanup process will run properly again. The “hanging ghost file” issue came up after one have run the TAC, and deleted enormous amount of data. The SQL Server can get into this hanging state (without the QFE) in certain cases due to this. For Visual Studio 2010: Install and set up the Test Attachment Cleaner (TAC) on your own computer. It works through the client API, so you can run it from any client computer. For Visual Studio/TFS 2010 download Test Attachment Cleaner command line power tool from here or download the TFS Power Tools December 2011 for TFS 2010. The TAC is included with this. For Visual Studio/TFS 2012 download the TFS Power tools. The TAC is included with this. See this post for information for the different versions. Are your database(s) growing ? Are unused test results growing out of proportion? To find out about this you need to query your TFS database for some of the information, and use the Test Attachment Cleaner (TAC) to obtain some more detailed information. If you don’t have too many databases you can use the SQL Server reports from within the Management Studio to analyze the database and table sizes. Or, you can use a set of queries. I find queries often faster to use because I can tweak them the way I want them. But be aware that these queries are non-documented and non-supported and may change when the product team wants to change them. Open a SQL Management Studio session onto the SQL Server where you have your TFS Databases. 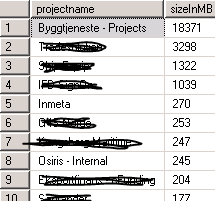 Use the query below to find the Project Collection databases and their sizes, in descending size order. Keep a special watch out for the Tfs_Attachment table. Use the script at the bottom of Grant’s blog to find the table sizes in descending size order. 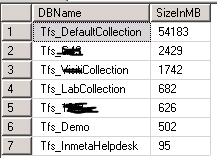 Add a “use Tfs_DefaultCollection” or whatever name you have for your collection database( s) at the top of the script. From Grant’s blog we learnt that the tbl_Content is in the Version Control category, so the major only big issue we have here is the tbl_AttachmentContent. In order to use the TAC to find and eventually delete attachment data we need to find out which team projects have these attachments. The team project is a required parameter to the TAC. As can be seen here it is pretty obvious the “Byggtjeneste – Projects” are the main team project to take care of, with the ones on lines 2-4 as the next ones. From this it is pretty obvious that the problem here is the binary files, as also mentioned in Anu’s blog. Now you should have collected enough information to tell you what to do – if you got to do something, and some of the information you need in order to set up your TAC settings file, both for a cleanup and for scheduled maintenance later. The TAC is run from the command line using a set of parameters and controlled by a settingsfile. 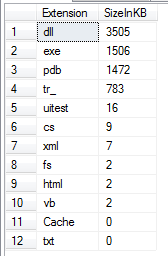 The parameters point out a server uri including the team project collection and also point at a specific team project. So in order to run this for multiple team projects regularly one has to set up a script to run the TAC multiple times, once for each team project. When you install the TAC there is a very useful readme file in the same directory. This rule minimizes the risk of the ghosted hang problem to occur, and further makes it easier for the SQL server ghosting process to work smoothly. This is the last step in a 3 step process of removing SQL server data. First they are logically deleted. Then they are cleaned out by the ghosting process, and finally removed using the shrinkdb command. When the deployment binaries are published to the TFS server, ALL items are published up from the deployment folder. That often means much more files than you would assume are necessary. This is a brute force technique. It works, but you need to take care when cleaning up. Grant has shown how their settings file looks in his blog post, removing all attachments older than 180 days , as long as there are no active workitems connected to them. This setting can be useful to clean out all items, both in a clean-up once operation, and in a general cleanup. 3.1: Cleaning up a database which has grown too big due to these attachments. This job is a “Once” job. We do this once and then move on to make sure it won’t happen again, by taking the actions in 2) below. In this scenario you should only consider the large files. Your goal should be to simply reduce the size, and don’t bother about the smaller stuff. That can be left a scheduled TAC cleanup ( 2 below). If you want only to remove dll’s and pdb’s about that size, add an Extensions-section. Without that section, all extensions will be deleted. Before you start up your scheduled maintenance, you should clear out all older items. If you run a schedule every night, and remove old items, and also remove them in small batches. It is important to run this often, like every night, in order to keep the number of deleted items low. That way the SQL ghost process works better. One approach could be to delete all items older than some number of days, let’s say 180 days. This could be combined with restricting it to keep attachments with active or resolved bugs. Doing this every night ensures that only small amounts of data are deleted. In my experience there are projects which are left with active or resolved workitems, although no further work is done. It can be wise to have a cleanup process with no restrictions on linked bugs at all. Note that you then have to remove the whole LinkedBugs section. A approach which could work better here is to do a two-step approach, use the schedule above to with no LinkedBugs as a sweeper cleaning task taking away all data older than you could care about. Then have another scheduled TAC task to take out more specifically attachments that you are not likely to use. This task could be much more specific, and based on your analysis clean out what you know is troublesome data. The readme document for the TAC says that it recognizes “internal” extensions, but it does recognize any extension. You could run a shrink database command after the TAC has run in cases where there are a lot of data being deleted. In this case you SHOULD do it, to free up all that space. But, after the shrink operation you should do a “rebuild indexes”, since the shrink operation will leave the database in a very fragmented state, which will reduce performance. Note that you need to rebuild indexes, reorganizing is not enough. For smaller amounts of data you should NOT shrink the database, since the data will be reused by the SQL server when it needs to add more records. In fact, it is regarded as a bad practice to shrink the database regularly. On a daily maintenance schedule you should NOT shrink the database. To shrink the database you do a DBCC SHRINKDATABASE command, and then follow up with a DBCC INDEXDEFRAG afterwards. I find the easiest way to do this is to create a SQL Maintenance plan including the Shrink Database Task and the Rebuild Index Task and just execute it when you need to do this.